Ofcom has released its sh*t list for Q1 2017, detailing the good ones and the bad ones from the UK telco industry in terms of complaints… drum roll please. Generally, the industry is actually getting better, despite what many would claim. Yes, the telco industry is behind the vast majority of others in terms of customer service and satisfaction, but you can’t argue with the figures. In terms of the average number of complaints per 100,000 customers, broadband is down to 21 over the course of the quarter, which compares to 40 in Q1 2011. Post-paid mobile contracts is down to six complaints per 100,000 customers, down from a high-point of 19 in Q4 2011. Pay TV hasn’t really changed since Ofcom has been collecting the data, but it is relatively low at five complaints per 100,000 customers, so it’s not anything massive to worry about. “Our report shows that, for a number of providers, there is still much room for improvement,” said Ofcom’s optimistic cheerleader, Lindsey Fussell, Consumer Group Director. In terms of those doing a good job, Sky seems to have won across the quarter. It received the lowest number of complaints in the broadband space, eight per 100,000 customers, as well as the lowest in the Pay TV arena, just two per 100,000 this time. Pretty impressive figures. Over in the post-paid mobile space, there was one star performer – O2, Three and EE all had low scores, but none could compete with the run-away winner. Somehow, Tesco Mobile managed to register zero complaints per 100,000 customers on average across the three month period. We’re assuming the average was so low, it was rounded down. Surely there must have been at least one complaint… unless, they don’t answer their phones!??! A bold strategy, but if the customer service people at Tesco never answer the phones in the call centre, there are no complaints to register. Could this be the beginning of a brand new craze in the telco industry! Don’t tell Vodafone, your correspondent has enough trouble getting through to them as it is. Talking of Vodafone, your correspondents mobile provider hit the bottom of the rankings, registering 17 complaints per 100,000 customers, almost triple the industry average. While that’s not great it at least reverses the alarming spike from the previous quarter as Vodafone continues to repair the damage done by BSS-ageddon a couple of years ago. 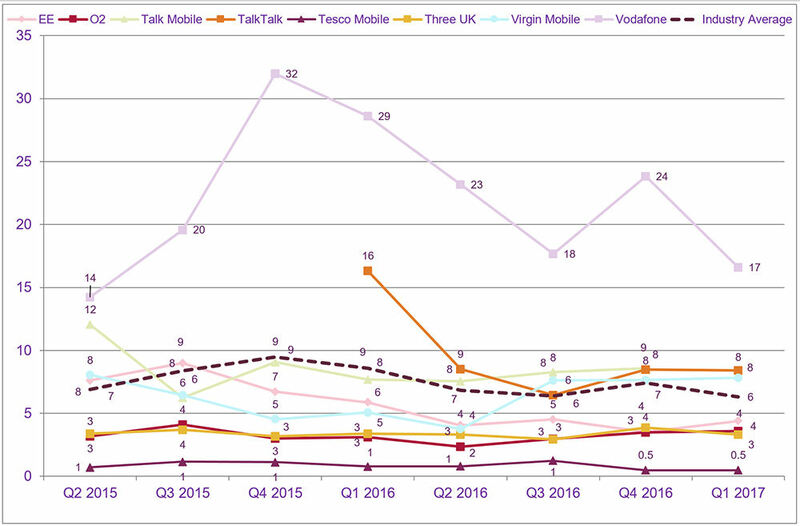 In the Pay TV space, BT was the worst, registering 19 complaints per 100,000 customers. That’s almost four times higher than the industry average which is five. BT was also bottom of the pile for broadband, though it would be unfair to single them out completely. In the broadband market, BT registers 34 complaints per 100,000 customers, but it finds itself some company in the naughty corner. EE registered 24, TalkTalk 29 and Plusnet 25. In general, overall industry trends are heading in the right direction, though this is generally because there are a few star performers. When you take the top performers out of the averages, it is still pretty glum reading.